Little Rock, Arkansas-based Small World Big Fun agent, Mandy Piechocki, is excited to be part of the Small World Big Fun family! She has been helping her friends and family plan their Disney vacations for years, so this role is the perfect fit. Her grandparents spent time every summer in Florida and watched Walt Disney’s dream come true as they were there the summer Walt Disney World opened in 1971. Mandy and her family traveled to Disney World every summer, and they still believe vacationing in the “World’s Happiest Place” is the best! So, you might say Disney is in her family’s DNA. Her favorite vacation memory as a child was riding the boat over from Fort Wilderness and catching that first glimpse of Cinderella’s castle. There’s nothing better! Mandy was chosen to participate in the Disney College Program and was a Cast Member for two summers. She worked at Disney’s Hollywood Studios and also Disney’s Wilderness Lodge. And it runs in the family because her sister was a cast member at the Magic Kingdom. The life-long experiences learned were invaluable for understanding customer service and why the overall Disney experience still stands as the blueprint for providing the best vacation experience for families. Mandy and her husband Michael have two daughters and are making their own special Disney memories! 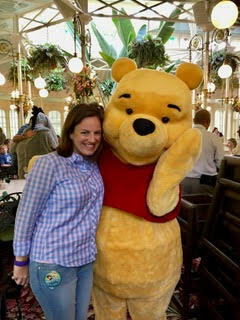 Because of her love and knowledge of Disney, she wants to help customize the perfect plan for your family and share with you the magical experiences that come with a Disney vacation. To get Mandy started on planning your vacation, call 501-658-1332 or email mandy@smallworldbigfun.com.